Miles grew up in a predominantly Black neighborhood in Long Island, New York but went to Catholic school in an all-White neighborhood. Miles, who is mixed race, couldn’t fit in anywhere. Each day, Miles would pedal his bike as fast as he could to get out of the all-White neighborhood while the White kids shouted threats of violence. Just as he would enter the safe haven of his own neighborhood, the Black kids would call out, “Hey, White boy!” “I felt like a ping-pong ball bouncing between two worlds, never feeling like I completely belonged to either,” says Miles who says diversity was embraced and celebrated in his home. He is the offspring of two Black grandfathers, a half-Chinese and half-Black grandmother and a White grandmother and identifies as a Black man. His love for football started as a young kid when he played Pop Warner leagues, on his high school team and at the University of New Haven where he was the school’s first all-American and its first player to be drafted by the NFL. Playing football at an early age helped Miles cultivate a strong sense of unity with others and, by going to battle on the football field, the players were able to create a bond between themselves that bridged their differences. During his first two years in the NFL, Miles smoked marijuana, chased women and used cocaine. Two of his teammates were Christian men who modeled the heart of God and challenged Miles to grow his faith. On April 12, 1984, at 5 in the morning, Miles had used cocaine all night and was lying on the couch with his heart pounding. While thinking about what his Christian teammates had been telling him about Jesus, Miles gave his heart to the Lord. He never touched cocaine or marijuana again and reunited with his old girlfriend, Debbie, later that afternoon. Five months later, they were married! After his four-year career with the Chargers was over, Miles felt called to ministry. He served as a youth pastor for eight years and launched Miles Ahead Youth Crusades where tens of thousands of kids from every background came to know Jesus personally. “I had finally discovered God’s true purpose for my life,” says Miles. He took over the Sunday night service at Horizon Christian Fellowship which grew from 600 to 3,000 in five years. Today he is the Senior Pastor of The Rock Church which he founded in 2000. His congregation is diversified: 48% White, 28% Latino, 14% Black, 7% Asian and 3% Other Ethnicities. “When we launched The Rock Church, my staff and I committed ourselves to reaching everybody in the city,” he says. To this day, they have remained committed to these principles and have expanded to five campuses and 13 microsites including one in Tijuana, one in a juvenile detention center and one in a state prison. “Well-meaning people of all backgrounds want to understand the racial issues that divide our nation,” says Miles. He says some people get angry or defensive when talking about race and says everyone is affected by racism. 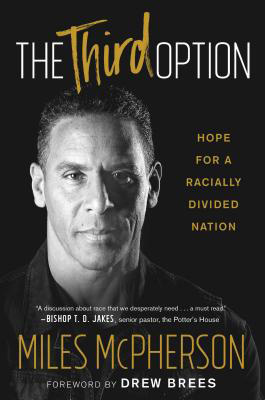 “Culture plays a big role in perpetuating racism by wrongly insisting that there are only two options to choose from: Us or Them,” says Miles. He believes culture pits one group of people against another by promoting a zero-sum-game mentality that says, “You must lose in order for me to win.” Miles however says there is a third option. “God offers us a Third Option that stands in stark contrast to the two offered by culture,” he says. “The Third Option is honor.” He further explains that when we honor the presence of God’s image in others, we acknowledge their priceless value as precious and beloved of God. “The Third Power empowers us to see people through God’s eyes, which enables us to treat them in a manner that honors the potential of His image in us,” he says. His wife, Debbie, also grew up in a predominantly African-American low-income housing project in Connecticut. She and her brother were the only mixed-race kids. Debbie, who is light-skinned (Mom was White/dad was Black) which made her and her brother targets of ridicule. She chose to honor the presence of God in every person instead of stereotyping.